SynoLoad/QGetMobile: Manage downloads on your NAS while on the go! If you have a NAS at home branded Synology or QNAP, you're lucky: an application able to manage downloads on your NAS from your Windows Phone 7 is now available! A NAS (Network Attached Storage) is a standalone tiny computer, plugged on the network (ethernet or wireless), with an internal hard drive, which doesn't use too much power. QNAP and Synology offer several models, with more or less features, which enables you to provide a website for your friends, host a blog with pictures, store your complete iTunes library, backup your files, video surveillance, etc... but also (very important in our case), download files: video, music, programs. Therefore, when you surf on the web from your computer, if you want to download a very big file, a small program allows your to send the link to the NAS who will download it on its own. You can now turn off your electricity consuming computer and go take a walk: the download will be done automatically. What's new here ? 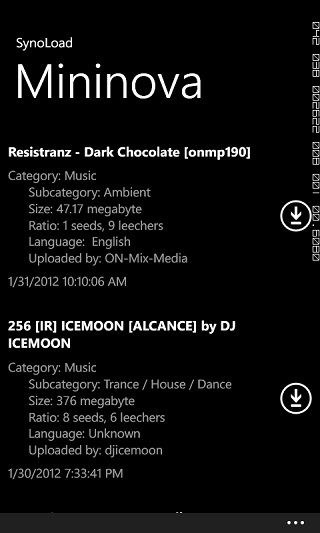 You can now do exactly the same from your Windows Phone 7, wherever you are ! The applications are named SynoLoad and QGetMobile. SynoLoad connects to your Synology NAS, and QGetMobile connects to your QNAP NAS. Both SynoLoad and QGetMobile allow you to connct to your NAS and manage your downloads while on the go, through WIFI or 3G. This way, you can use your mobile web browser to look for something to download, send the link home to your NAS and the file will be ready when you come back home in the evening ! To connect to your NAS from either SynoLoad or QGetMobile, you just have to enter your credentials (IP address or hostname, port, username and password), and connect. You choose to connect with HTTP or HTTPS which allows securising the connection (for that, you will need a Trusted Certificate). Once connected, you have access to the list of downloading files, and of course, see the download speed, pause/resume or stop the download. Clicking on the "+" will add a new download directly to the list and start the download. Easy! If you want to see more information about a specific file, just click on it ! The integrated web browser accessible with the Internet Explorer icon allows you to suft and choose files to download with a long click. Just touch the link, and it'll ask to download it ! You can choose anything, even Bittorrent files (and NZB files for SynoLoad) ! You continuously follow updates of a specific program ? A RSS feed reader is available in the application, and allows you to be aware of news. Just add the file to downloads with a single click ! And finally, the most advanded feature is the ability to search for files on different search engines at once. By default, Mininova is available and allows you to choose a free video or music. 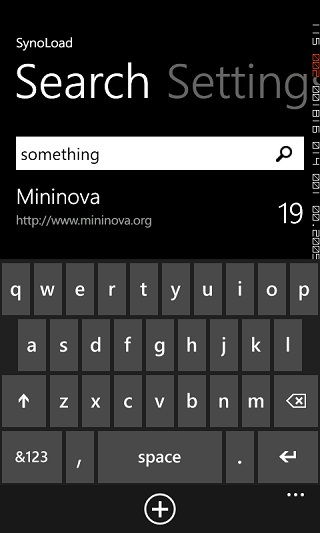 If Mininova isn't enough, you can enter your own or just go through the list available on dev.patey.net. And if you don't own a Windows Phone 7, jump to the website: both applications are also available for iPhone/iPad, Android, Nokia (Symbian) and Windows Mobile.